Boss Craig McAllister branded Gosport Borough's 3-2 defeat by Beaconsfield Town at Privett Park 'sloppy'. 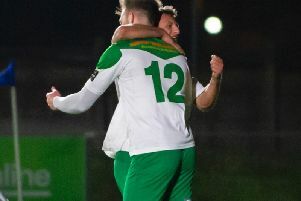 Borough fell behind twice before battling back to level matters only to lose their Southern League premier division south contest to an 82nd minute goal on Saturday. McAllister was far from happy. He said: ‘Sloppy goals sums us up. ‘Their first and last goals stemmed from our individual errors. ‘We started well and had talked beforehand about not giving away silly goals. ‘Then we go ahead and do just that. ‘After that we created one or two chances of our own and got a goal back. ‘In the second half we were powder-puff at times and didn't get on the front foot soon enough. ‘After we fell behind again the lads showed the desire to hit back again. ‘In the end though a lack of desire from us to defend allowed them to score the winner. Pat Suraci scored Borough's first goal with a fine individual strike and Tony Lee scored their second with a brave header. 'At times I saw improvement but we keep making individual errors,' said McAllister. Borough face Poole Town at Privett Park on Tuesday (7.45pm). Walsh hit a stunning 25-yard screamer into the top corner. The Rocks broke the deadlock in the 51st minute when Bradley Lethbridge nipped in to score. Angels levelled the scores on 67 minutes and the game looked to be heading towards an inevitable draw. Walsh, however, had other ideas. The win keeps the Rocks in the top three and cut Angel's lead at the top to two points. The Rocks take on Folkestone Invicta at Nyewood Lane on Tuesday (7.45pm).